Not all those who wander are lost. : It's our anniversary. Our anniversary. On October 20th, Reece and I rang in five years of non-marital bliss. What better way to celebrate than at the finest hotel that credit card points can buy?? They say go big or go home - And well, we aren't ready to go home yet. 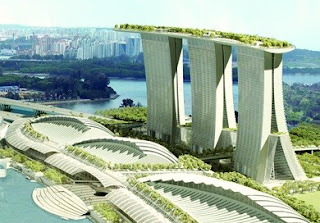 The Marina Bay Sands is an architectural behemoth, towering over Singapore's skyline and topped by what must be the highest infinity pool in the world. Dressed in our backpacking finest, we enjoyed a fancy three course lunch at pretty garden restaurant in the city, then waltzed up to the reception desk like real VIPs. Only our room wasn't actually going to be ready until 6pm. "Well, the check out time is noon, but most people don't really leave till 2 or 3." Sweet, so can we have a late check out tomorrow? "No. The latest I can allow you to check out is 12pm." Ummm... Okay, can we use the pool after we check out? We have an evening flight. "Well, you actually can't use the pool without your room key, which you must return when you check out." Hmm. Well, can we wait by the pool now until our room is ready? "Sorry. Not until you have checked in." Hey, do you have a drink menu? We heard there is an amazing mixologist by the pool. "Oh, that won't be happening until next year." Okay. Well it's our anniversary, can we get a bucket of ice for our bottle of champagne? "No, you can't drink that here. The glass is too dangerous." Alright. Well, where do we find that nightclub where the DJ is playing tonight? "Actually, you need reservations for that two weeks in advance." Perfect. Can we see the food menu? "Yes. We have turkey wraps or chicken flavored chips." The best part about it, is that we were prepared to spend a lot of money at this place! It's not every day you celebrate 1,825 days with your dearest whilst on a trip around the world. Our motto was, "Charge it, and pay it off with points." But they could not get it together enough to even allow us to splurge. To be honest, we kinda couldn't wait to get back to our 13-bed dorm room at the Beary Good Hostel, where the employees consistently aimed to please. I suppose the moral of this story is - Just because it costs more, doesn't mean it's better. The view, however, was pretty freaking amazing. sorry it wasn't as cool of a hotel as you thought...but that 'sweet' at the end cracked me up! happy 5 years!